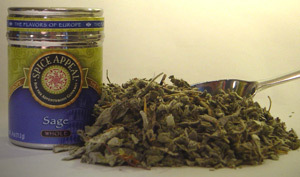 Translated as the “sacred herb,” Europeans associated this herb with wiseness and longevity. Valued for both its culinary and medicinal properties, sage was grown on imperial farms in central Europe during the 9th Century. This astringent, spicy and bitter flavor has a camphor-like aroma and provides a cooling sensation in the mouth. Due to its dominating flavor, use sparingly in European cooking. Use in chowders, pork, poultry stuffings, sausages, baked fish and cheese. Pairs well with onions, butter, tomatoes, garlic, fatty fish, game, poultry, gravies and breakfast sausages. Complements any full-bodied soup, stew, meatloaf or roast meat dish.